While I was researching for another piece, I found myself caught in one of those inescapable YouTube loops. You know, where every video you watch leads to another, and pretty soon the whole morning is shot. But this one I thought was worth sharing. We’ve all read how gill nets and driftnets are a huge danger to sea turtles, sea birds, and marine mammals (not to mention, of course, to their intended catch). What I want to do today is bring that message home with this series of videos showing people rescuing marine animals from nets, ropes, and fishing line. Obviously, the rescue of a single animal has little effect on the overall by-catch from these nets. But there is something touching and inspiring about these videos that reminds us that “by-catch” doesn’t just mean more fish. Michael Fishbach, co-founder of The Great Whale Conservancy (GWC), narrates his encounter with a young humpback whale entangled in fishing nets. After the lengthy rescue, the whale performs a joyful display for several hours, giving Fishbach and his crew a thrilling show .. and perhaps a thank you? This roped whale shark (which is a shark, not a whale) seemed to seek help from three fishermen off the coast of Australia just south of Sydney in March, 2003. It took two full days to free this gray whale, caught in nets near Laguna Beach, CA. The net, also contained a sea lion, a leopard shark, two angel sharks, various crabs, fish and rays. After being freed, the whale returned to the boat, close enough to be touch, raised his head out of the water and opened his mouth towards the crew. The crew says they took this as his thank you. This one I found particularly heartbreaking. 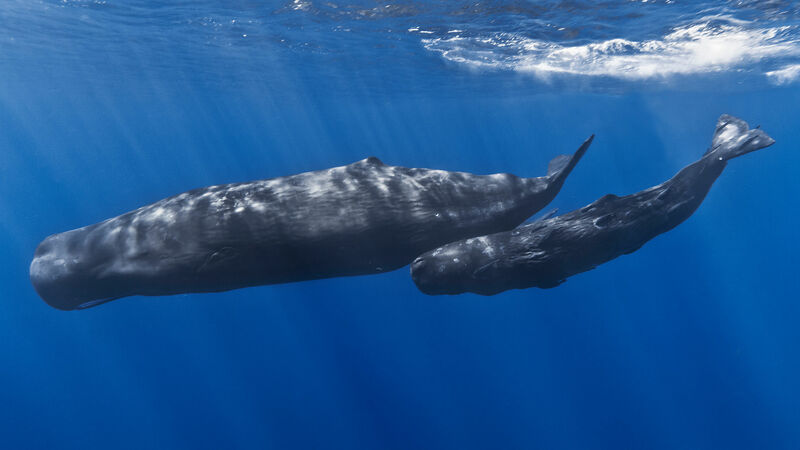 In 2004, an entire pod of sperm whales — 2 adult females and 3 young — were found fully entangled together in a drift net near Italy. It took rescuers two days of extraordinarily patient work to free them. It’s hard not to feel their terror as you imagine those first moments of entanglement, when they fought the net only to wrap themselves and each other tighter into it. And what it would have been like after days of being fully trapped, near drowning, with their children alongside.